Arnold Anchordoquy was born in Bakersfield, California. He is married and has three children, has resided in Bakersfield for his entire life and enjoys being a part of the local Basque community. Mr. Anchordoquy attended Garces High School in Bakersfield. Thereafter, he attended St. Mary’s College in Moraga, California, and then matriculated to the University of Pacific, McGeorge School of Law in Sacramento (J.D. 1973). He was a member of Phi Alpha Delta and Moot Court Honors Board (1972-1973), and worked in the California Department of Social Welfare while a student. After graduation Mr. Anchordoquy joined the Kern County District Attorney’s Office. In 1975 he joined Noriega, Clifford, Jenkins & Brown, the predecessor of his present firm. Mr. Anchordoquy is a Partner with the firm. Both the firm and Mr. Anchordoquy are AV rated by Martindale-Hubbell. Mr. Anchordoquy maintains a general civil litigation practice with emphasis in personal injury lawsuits, property and casualty claims, sexual harassment and discrimination cases, employment litigation, bad faith litigation, products liability, commercial litigation, and other matters. 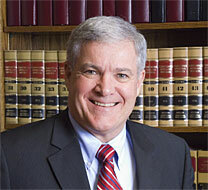 In his years with Clifford & Brown, Mr. Anchordoquy has tried over 50 jury trials to verdict, including a variety of personal injury cases, class actions, business disputes and matters arising out of ADA and FELA claims.